It should be obvious the books are actual live-action books but I thought there was a string or something pulling the cover open and turning the pages. Yes, the books were real. On this page you can see the actual book props used in the films. This article also gives some info about it. What I don't know is how they were opened in these opening sequences. In the case of the Snow White book, we don't get to see the upper right corner, so I guess someone is opening it from there. But in other cases, such as in Cinderella, we can see the whole book while it opens, so they must've used a string, as you say, or some other trick or maybe stop motion. Were the books in The Jungle book, Robin Hood, The Sword in the stone, The many adventures of Winnie the Pooh and Enchanted real too? I think the book in Enchanted was CGI. The one in The Many Adventures of Winnie the Pooh was real, but if you pay attention, before the book opens they change to a shot of an animated book. The other three, though, were real books. 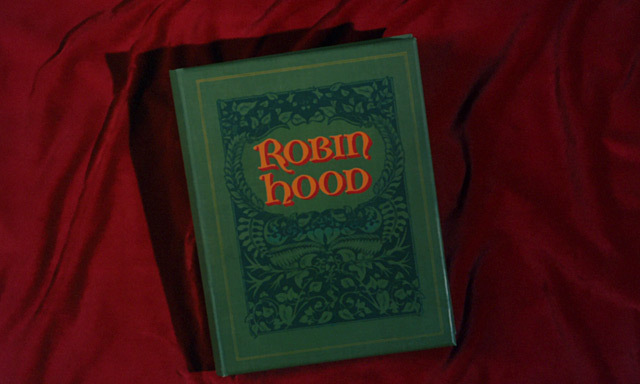 One curious thing is that the ones in The Jungle Book and Robin Hood are actually the same book. If you notice, the ornaments are the same, they just changed the title for Robin Hood. That's explained here. 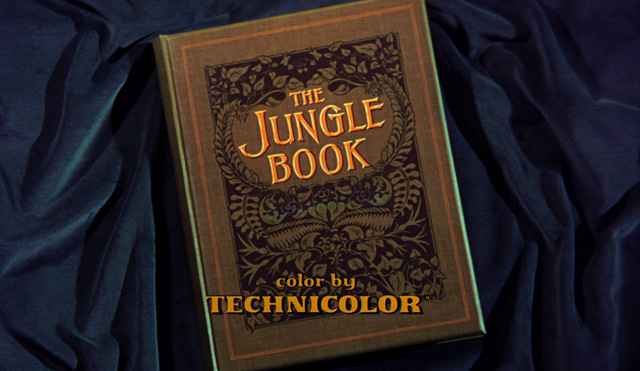 And as they say there, that same book was also used for the end credits of the live-action Jungle Book movie. I LOVE this awesome trailer for the Snow White Platinum Edition. Anyone else remember it or love it? I really love the music! Wish I could find the whole music somewhere. I've never seen that trailer before so thanks for posting it! Or if I had seen it I don't remember it. Unfortunately I'm not sure where to find the music for it either. That reminds me of the villains version of the trailer, which I do remember seeing on TV lots of times when the platinum edition was out. It also has some great music. There's also this princess version which I had never seen before but I just found it right now. The music for each princess is so enchanting and Pocahontas has perhaps my favorite theme out of them all, but I just wish Jasmine was in it. She makes a much better fit than Mulan imo. The Princess trailer for the Platinum Edition is one of my favorites. It's so well done and the music is so beautiful. In fact, I think the all the trailers Disney did for the Snow White Platinum Edition were awesome. Are we sure that princess one isn't more recent? Because the clips used seem too pristine and artifact-free to be from 2001 The clip of the Duke putting a glass slipper on Cinderella's foot is also in the one Disney Duster posted and looks way worse than here. I also noticed that the clips used in the Princess trailer look better than the ones from the movies themselves. But I think it is from 2001. I remember seeing it on the official Disney website. I also noticed that the clips used in the Princess trailer look better than the ones from the movies themselves. True, especially Beauty and the Beast. Btw, Sicoe Vlad, I just noticed your location info underneath your avatar. I visited Timisoara last September and loved it there, it's a really charming city. Happy you liked it. it's one of the most beautiful in Romania. One of the few with lots of green spaces. Indeed, I really enjoyed walking through Botanical Park, LOTS of green there Victoriei square, too. Thanks guys. Thanks for the other trailers JeanGreyForever. The music in the villains one is cool and I had seen it before but the Princess trailer, oh man!!! I also just saw that yesterday when I posted the first trailer they made for the Platinum that I posted. You're right that the themes used are really nice and that Jasmine should have been in the trailer. I wouldn't have had Mulan or Pocahontas in and replaced them both with Jasmine but that's my personal preference. My favorite themes are actually Ariel's fourth, Belle's third, Aurora's second, and surprisingly actually, Cinderella's first. It's so beautiful! We should get the whole movies to look like that, just highest quality, like you guys said! Cinderella's theme is my second favorite after Pocahontas' theme. Followed by Aurora, Belle, and then Ariel. I can understand why you would want Pocahontas to be excluded as well but I actually quite enjoyed her presence since I consider her more of a princess than Mulan anyway. In a different world, I'd like to have seen Anastasia included in the trailer as well. They could have picked something Russian and haunting for her theme. Jasmine's I imagine would be very magical à la A Whole New World. Oh you like those themes, cool. Yeah, Pocahontas is more of a princess than Mulan that's true. I managed to find the original music for most of the princesses featured in the Snow White platinum trailer. Everyone except Mulan lol. Almost all of them are from Immediate Music except for Ariel's part. Wow! How did you find these? I loved listening to all of them. Strangely, I didn't really like Cinderella's as much this time except for the end. To me, the ones that really stood out as beautiful or powerful were Belle's and Pocahontas's. I actually Shazamed them, although interestingly enough I got a completely different one for Snow White the first time I did it. I think the dialogue from the narrator messed it up. Pocahontas' is still my favorite but Belle's has become my second fav. I agree, that they're the most powerful and moving. I even found a beautiful video that compiles clips from several Disney movies set to the music of the Pocahontas one. Before watching this video, I didn't notice the thunder/lightning motif that repeats itself and the maker of the video did a great job of syncing those moments with actual thunderstorm scenes from classic Disney films. Was hoping there would be something similar set to the music of Belle's but couldn't find anything. Wow, that music video was pretty amazing. That Beauty and the Beast transition from the dance to the ending was so amazing, why hasn't Disney ever did that before! It actually took me a moment to notice that because the transition felt so natural that I didn't think anything of it. On a replay I realized what actually happened and I had the same thought you did that there's no excuse for Disney not to do this themselves.